Veteran world track star, Veronica Campbell-Brown (VCB) is set to steal the spotlight in the women’s sprints at this week’s Jamaica Nationals, to select Jamaica’s team to the Rio Olympics later this summer. VCB, 33, has long been Jamaica’s sprint standard-bearer, and has won 45 international medals, making her one of the most important athletes in the history of the sport. The former Vere Technical High School star should be celebrated and admired for helping to set the stage for the renaissance in Jamaican sprinting, along with nemesis-compatriot, Shelly Ann Fraser-Pryce (SAFP), Asafa Powell, Usain Bolt, and a plethora of other high achievers. The amazing Merlene Ottey, a mentor of VCB’s, was 32 years old when she won her first global title, the 200m at the 1993 World Championships in Stuttgart, Germany. She retained her title two years later, in Gothberg, Sweden. Both Ottey and VCB have more in common than meets the eye. Both went to Vere Technical and starred at the Boys and Girls Championships, both have won medals in every open competition, both had performance-enhancing drug accusations overturned, and both women featured in Olympic selection controversy, in the 100m. In 2000, in Sydney, Australia, Ottey got the nod over Peta-Gaye Dowdie, who had won the 100m at the Jamaica Nationals, but who had subsequently lost form, having struggled with a nagging injury. Some members of the Jamaican contingent believed that Ottey, the darling of the media and Jamaican track fans, and long rumored to replace Dowdie, injury or not, used her celebrity to thwart the young upstart, then 23. Ottey, at this time, was just returning to form, at aged 40, after the drug controversy. The Jamaican Selection Committee explained the clause in the selection process, which, to paraphrase, states that an athlete, even if a top three position at Nationals, can be replaced because of injury or loss of form. The Dowdie replacement, at the time, seemed a justifiable position, but it nonetheless led to an embarrassingly ugly media glare. Although Ottey went on to narrowly miss an individual medal in the 100m, having finished 4th, at the Southern Olympiad, the gold and silver medalists were later suspected of using performance enhancing drugs (PEDS), and stripped of their medals. Incidentally Ottey’s placing and that of teammate Tayna Lawrence, who had finished third, were not upgraded. Ottey, along with Lawrence then helped Jamaica to a silver medal in the 400m relay. Ottey’s inclusion on that 100m stung, and protest at the Games later led to her switching allegiance to Slovenia, where she had long lived and trained. It would be many years before she returned to her native land, to a hero’s (or heroine’s) welcome, a move engineered by the then Jamaican prime minister, P.J. Patterson. At the time, young VCB was included on that sprint relay to Sydney thus receiving her first Olympic medal. Interestingly, just as Patterson played a role in Ottey’s triumphant return to her homeland, he too played a role in representing VCB, in her successful PEDS accusation. Although Jamaican officials might have toyed with the idea of replacing SAF (later SAFP) in 2008, it could not afford another Sydney episode. Keeping the 100m team intact was the right move in ’08. The physically diminutive bullet-starter, Pryce, won the Olympic title going away. Her teammates, the remarkable Kerron Stewart and the quietly great Sherone Simpson both copped silver, in a dead-heat finish. Many point to this as evidence that if Dowdie had been left on the team ’00 team, she might have achieved some measure of success. This is argumentative, but SAFP is a very special and incomparable athlete. I believe that the decisions taken in both 2000 and 2008 were correct, all things considered. I believe that VCB won gold because she was able to put all of her energies into the Beijing 200m, not having the added stress of the 100m. And in fact, she turned the tables on American Alison Felix, who had had a winning record over her. Her title defense assured in a then PB of 21.94secs, which, today eight years later, remains a fantastic time. Long rumored to share a frosty even-in-the-dead-of-summer relationship, SAFP and VCB remain tough-as-nails competitors, who hate to see the back of each other in competition. Both have bounced back from relatively lean years and brought sunshine and delight to the hearts of their fans and admirers. 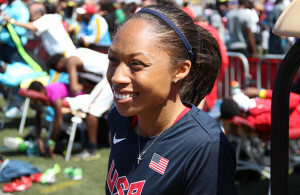 Case in point, many thought Brown had passed her prime and had very little chance of medaling at the 2015 Worlds, in the 200m. Nevertheless, she turned out, ran gallantly, and kept in touch with the formidable field in an every-inch-of-the-way contest, finishing third for a bronze in a world-class 21.97secs. The race was won in 21.63secs by Netherlands’ former heptathlon star, Dafne Schippers, followed by Jamaican sensation, Elaine Thompson, 21.66secs. This week’s Nationals will answer some questions for track fans. 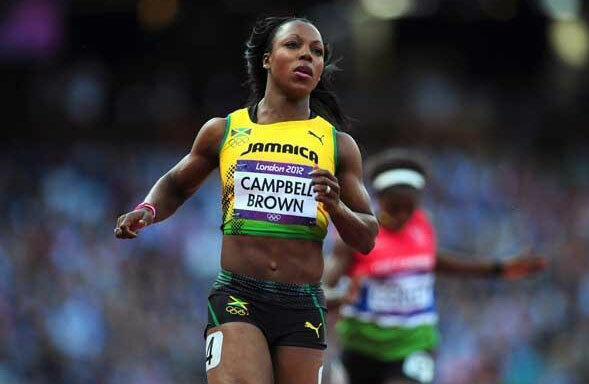 How will the sprint combatants Campbell-Brown and Fraser-Pryce fare? Who can tell? For one thing, the latter has raced sparingly, finishing down the track at Eugene’s Prefonatine Classic, in May. She bounced back to win at the Racers Grand Prix, in Kingston two weeks ago, in 11.00secs, a far cry from her heart-stopping world leads. She is nursing a bothersome toe injury, and I believe that her national crown is in jeopardy. If she cannot continue to train properly and find top form quickly, she will not three-peat in Rio. Count her out at your own peril, however. She cannot be toyed with. Meanwhile, the diva, Campbell-Brown, continues steady progress. She has run 10.87secs and twice, 22.29secs, in the 100m and 200m, respectively. She is quietly improving again, even at 33. She has once again made me a firm believer in her never-say-die-attitude. She is a proud athlete, and like many of the best, hates to lose. I think she will take the double at Trials. Admittedly, the competition is not as strong as a few years ago, or even last year, with the absence of Simpson, out with a hamstring injury and pregnancy. Expect Kerron Stewart to give an honest performance as usual, which leaves the high-flying Thompson, 31-year-old veteran Simone Facey, the unsmooth Christiana Williams, and of course crowd favorite, Fraser-Pryce. They all should be eating the dust in the wake of Veronica Campbell-Brown. The 200m should be even easier, as aside from the inconsistent Thompson, the road to victory is ultra smooth. Finally, how does Campbell-Brown stack up to Fraser-Pryce, the Ivory Coast’s Muriel Ahouré ‘s season best of 10.78secs, Americans Torrie Bowie’s 10.80secs and English Gardner’s 10.81secs, Schippers’ 10.83secs, and a slightly slowed Blessing Ogkabare of Nigeria, in the mention, at an 11.09secs season best? Well, Mother Nature and Father Time will tell, when the heat bears down in Brazil this summer. Expect fire and brimstone at the start of the women’s sprints at Jamaica’s Nationals and in Rio. 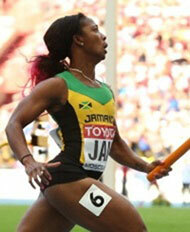 Whatever the outcome though, I expect a scintillating sprint display from the veteran Jamaican diva.